Distinctive job: Iskandar Investment president and CEO Datuk Syed Mohamed Syed Ibrahim (left) exchanging documents with Distinctive Group chairman Datuk Dr David Koh after signing an agreement for the latter to develop a parcel of land in Iskandar Malaysia called 18@Medini for a gross development value of RM1.5bil. PETALING JAYA: Iskandar Investment Bhd has signed a lease purchase agreement with Distinctive Ace Sdn Bhd, a member of Distinctive Group, for the latter to develop a parcel of land in zone A of Medini into a mixed commercial development project with a gross development value (GDV) of RM1.5bil. The 99-year lease purchase agreement between the two involved the purchase of a gross floor area 2.75 million sq ft over 18.05 acres of land at a consideration price of RM99.9mil. Distinctive Group chairman Datuk Dr David Koh said the entire project would be undertaken in four phases over the next five years. “The first phase, comprising shop office and service apartments, would be launched in the second quarter of next year. The first phase will involve the development of a gross floor area of 957,000 sq ft with a GDV of RM500mil. “However the registration of interests is welcome with immediate effect,” he told the press after the signing agreement ceremony yesterday. Koh further elaborated that the development, dubbed the 18@Medini, which would be close proximity to Legoland, would be at the very soul of Medini Iskandar with its colourful and diverse offerings to include retail spaces, small office home office, small office versatile office, corporate offices, show rooms, food and beverages outlets, business and entertainment centres, an indoor sports and exhibition centre, service apartments and hotels. Iskandar Investment president and chief executive officer Datuk Syed Mohamed Syed Ibrahim said together with Distinctive Group, they had synergised their capabilities to give form and function to real estate landscape for the development of 18@Medini. “This development will serve to make and complement Nusajaya into a cohesive eco-system that befits what we have envisioned,” he said. Koh said actual construction work for 18@Medini would start sometime next year. 18@Medini is the third project of Distinctive Group in Iskandar Malaysia. Its first 1 Tebrau on Jalan Tebrau was a modern lifestyles mixed commercial project in Johor. Distinctive Group's second project there involved a joint venture with Medini Land Sdn Bhd to luanch Iskandar Residences two towers of 39-storey and 28-storey luxury apartments over 6.31 acres in the heart of Medini. KUALA LUMPUR: Distinctive Group, a real-estate developer, has purchased a 7.22ha land for RM99.92 million in Iskandar Malaysia, Johor, with a plan to develop the area into a mixed commercial project, comprising business and lifestyle components. The project is expected to have a gross development value (GDV) of about RM1.5 billion. 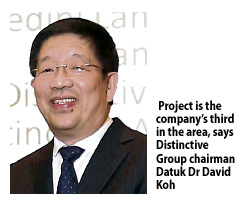 Called 18@Medini, Distinctive Group chairman Datuk Dr David Koh said this project is the company's third in Iskandar Malaysia after the first on Jalan Tebrau and the second known as Iskandar Residences. 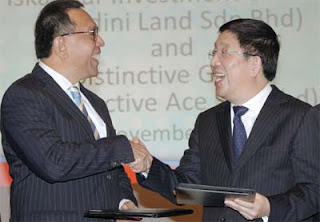 "We look forward to jumpstart our third project in Iskandar Malaysia, which I am confident will be the pulse of Medini Iskandar upon its successful completion in about five years," he said in his welcoming remarks at the signing of a leasing agreement for the land between Distinctive Ace Sdn Bhd, a member of the Distinctive Group and Medini Land Sdn Bhd of Iskandar Investment Board (IIB) here yesterday. Koh said the entire project is scheduled to be undertaken in four phases over the next five years, with the first phase, comprising shop offices and service apartments, to be launched in the second quarter of 2013. "We are confident that 18@Medini will be a viable proposition for both local and regional investors, with an assurance of positive returns," he said. He said 18@Medini will be the very soul of Medini Iskandar with its colourful and diverse offerings to include retail spaces, small office home office, small office versatile office, corporate offices, showrooms, food and beverage outlets, business and entertainment centre, indoor sports and exhibition centre, service apartments and hotels. Speaking to reporters later, Distinctive Group chief executive officer Lim Ech Chan said the first phase of the project, which is expected to commence sometime next year, will cover some 88,908sq m of retail spaces and service apartments, with an expected GDV of about RM500 million. Commenting on the 18@Medini project, IIB president and chief executive officer Datuk Syed Mohamed Syed Ibrahim said this proposed development is well-poised to capitalise on its proximity to EduCity, Puteri Harbour and many others, with an easy accessibility to the coastal highway leading to the city centre. "It is also strategically located at the confluence of Lebuh Kota Iskandar and the spine road leading to Legoland Malaysia and the Mall of Medini," he said. Distinctive Group's maiden foray into Johor, in particular Iskandar Malaysia, is the commercial development on Jalan Tebrau, Johor Baru, called 1 Tebrau. Next in the pipeline and the group's second foray into Johor is Iskandar Residences, a luxury condominium project in Medini, Iskandar. This project by Distinctive Resources Sdn Bhd is a 20:80 joint venture between Medini Land Sdn Bhd, a wholly owned subsdiary of IIB and Dsitinctive Group. In need of assurance: The site of one of the proposed developments is located a few hundred metres from Highland Towers. 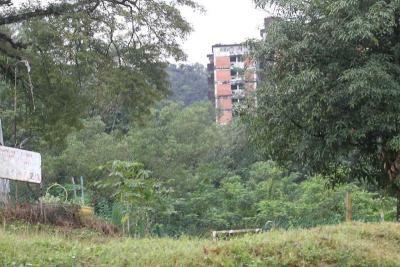 PROPOSED developments that will be constructed not far from Highland Towers and Bukit Antarabangsa, areas known for landslide tragedies in the past, have made some of the neighbourhood residents jittery. They are determined to ensure that these do not undermine their safety. Some 100 residents attended a peaceful protest organised by the Taman Sri Ukay & Taman Hillview Special Action Committee yesterday. The residents had submitted their objection against the two proposed developments, including one that will take place a few hundred metres from Highland Towers itself. The latter involves the construction of five 17-storey blocks comprising 70 duplex condominium units. The other development will be constructed near Taman Hillview entrance, comprising three 40-storey blocks of 1,000 serviced apartment units. “We are extremely concerned that our interests are not being safeguarded by the Ampang Jaya Municipal Council (MPAJ), after finding inconsistencies in the information provided by the developers,” Special Action Committee spokesman Lee Joo Khim said. She said the residents had attended a briefing with both developers on Oct 3 and had requested for certain documents including geotechnical reports and layout plans. The briefing was organised by MPAJ. “In the bigger project, we found a discrepancy in the land title as it states a land size before the Government acquired part of the land to build the Middle Ring Road II. “That will affect the plot ratio calculation,” she said. She added that the worried residents had not received a reply from MPAJ — whether the documents were the same as the ones submitted to the council or not. As for the other project, Lee said the developer had not given them any of the requested documents, citing legal reasons. “They had organised a presentation on Oct 23, which was attended by the Residents’ Association Committee. “The Special Action Committee did not attend this presentation as we felt it was pointless, seeing that we would have no way of verifying the information they presented,” said Lee. She said the residents just wanted to know the proper procedures, guidelines and rules and that developments carried out should be within reasonable limits. MPAJ Town Planning Department director Nizam Sahari said both development proposals had been sent to the state Environmentally Sensitive Areas Development Technical Committee for endorsement. “This is part of the process for any slope development application. Both projects have to follow all the guidelines and laws that guide these developments,” he said, adding that the projects would be built at the foot of a slope that was privately owned. “A properly engineered and maintained slope is safer compared to one that is left on its own,” said Nizam, adding that the estimated cost to engineer the slope was RM12mil. Nizam also said that both projects essentially met the guidelines and legal requirements for such development, although neither had yet to be approved at this point.